You may think you know Hatch: Oxford Road’s pop-up-shop hipster haven, built from brightly painted recycled storage containers. Well, think again. In time for the festive season, Hatch have expanded — and not just in size. The small food court is now tucked away in a corner. 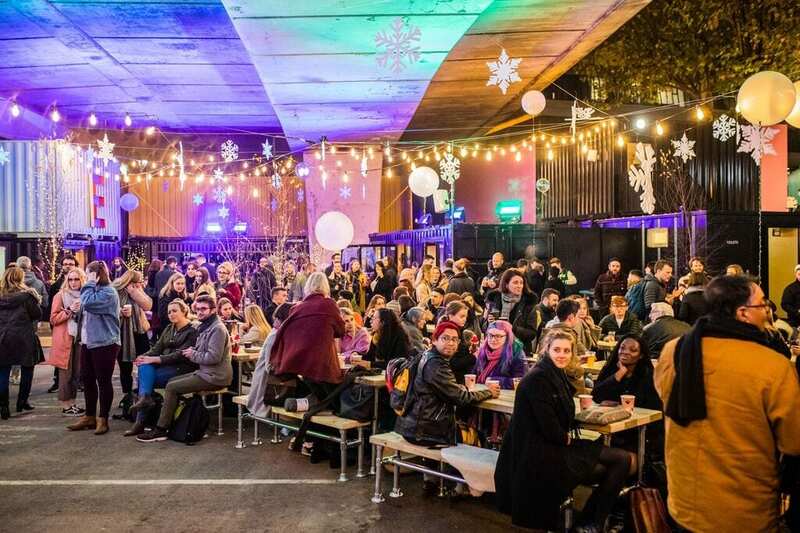 Whilst still cosy and inviting, its spotlight is somewhat stolen by a huge, outdoor courtyard surrounded by even more pop-up shops and a stage for live music performances. Urban Narnia featured performances from ‘Jenna and the G’s’, playing some revamped old-school Christmas classics, and the ‘AV Ice Queen with Mr Tumnus and the Fabulous Fauns’, who injected a bit of magic into the evening. 11 new traders launched at the opening event, including Suzie loves Mylo, a vintage clothing store; Betty and Butch, a gift shop for dogs and owners; and Laura Jordan, a London based cityscape artist’s gallery. These sat among the new food and drink shops that showcase the best of Manchester’s eclectic cuisines and tastes. Among these were Japanese Junk, a junk food truck from the creators of high-end Japanese cocktail bar and restaurant, Cottonopolis – they sold burgers, bao buns, and Japanese inspired snacks. Personally, however, my highlights were the indulgent, garlic mushroom topped, mac and cheese from The Mac Shac and the fresh cod tacos from Cayuco which were accompanied with pickled cabbage and a delicious mango salsa that made for a beautifully multi-coloured meal. A tipple to go with your food can be found at Electrik Box or ÖL Nano Brewery — two craft beer traders who also sell wine, cocktails, and even a warming mulled cider. Electrik Box, especially, has cosy indoor seating to shelter from Manchester’s winter weather, and an upstairs balcony that looks out onto Oxford Road. Not the most scenic or peaceful balcony perhaps, but it is entertaining to remind yourself of the novelty of Hatch: the perfectly crafted hangout situated right on the edge of a main road! Up until the 20th December, Hatch is hosting multiple events for all ages with plenty of live music, DJs, and performances; there’s even a ‘Festive Family Rave’ for the kids and ‘Santa Paws’ — a night for your furry friends hosted by Betty and Butch.